2 guest rooms for a peaceful stay. When booking on the calendar it is possible that rooms always AVAILABLE, thank you for asking if this is the case. For meals, possibility of table d'hote or a la carte dinner at the inn, if the weather permits, you can enjoy the terrace. You are surrounded by nature, near the forest and near a llama to park in the property. 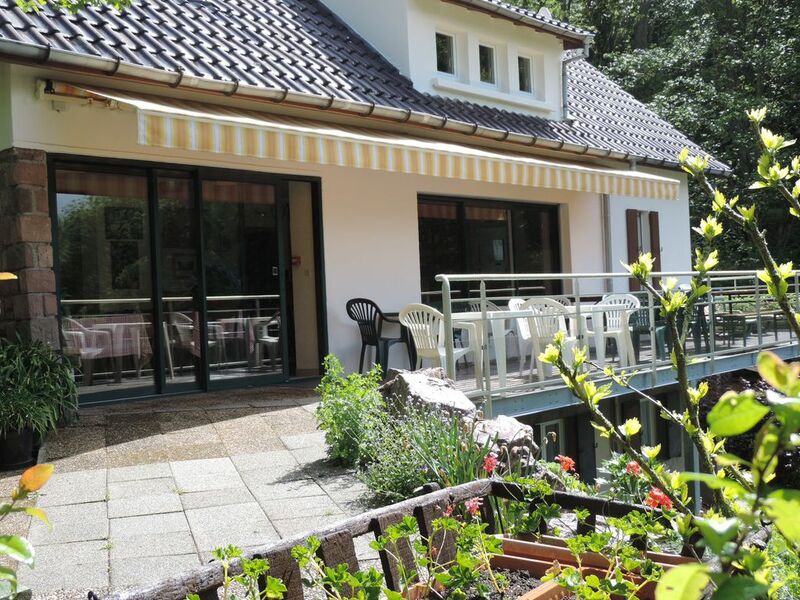 We are located in the heart of Ballon des Vosges Park, Grand Ballon, highest peak in the Vosges, and 10 minutes by car. For lovers of mountains and hiking, GR5 is a few hundred meters. You are cyclist or mountain biker? a variety of tours awaits you, including the route of Crete. For paragliders, the Treh site is 16 km, and fishing enthusiasts can practice their hobby at Wildenstein dam, and in the river of 1st category: Thur, and numerous ponds. For history lovers, the Hartmannswillerkopf Site (Old Armand) War 1914-1918 is a few minutes from your holiday. You can also visit the Ecomuseum and the Little Prince Park and its attractions. Not to mention the Wesserling Park with its textile museum, Mulhouse and you have the Auto Museum, among others. In summer the area is beautiful and worth a visit, and winter coming on your skis or snowshoes. Not to mention the various Christmas markets, each with its special atmosphere and its Thann, Mulhouse, Colmar, Strasbourg. passing in Alsace according to your preferences. Die Lage war für uns vier Wanderer ideal (Nähe zu Grand Ballon und Hartmannswiler Kopf). Die Zimmer sind für je zwei Personen großzügig bemessen (mit mehr als zwei Personen pro Zimmer könnte es - je nach Ansprüchen - etwas eng werden). Pro Zimmer gibt es ein modern eingerichtetes neues Badezimmer - Sehr gut! Die Betten sind gut - wir haben sehr gut geschlafen. Die Ruhe im Wald ist wunderbar. Wissen sollte man, dass es KEINE Kochgelegenheit in den Zimmern gibt und dass die beiden Zimmer nicht verbunden sind, also keine gemeinsame Wohnung bilden. Im Grunde muss man also das Frühstück dazubuchen. Das ist aber sowieso extrem zu empfehlen: Es gibt vom Hausherrn selbst gebackenes sehr gutes Brot, dazu Honig von seinen Bienen, Marmelade, Käse und Wurst - alles aus unmittelbar lokaler Produktion und sehr lecker! Die Croissants waren traumhaft. Herr und Frau Freyburger sind sehr freundliche Gastgeber, die wir nur empfehlen können! Nous avons apprécier notre séjour de 3 jours,endroit calme,propre,bien situé,déjeuner et souper du soir bien copieux. A faire en famille,en duo,ou en solo. séjour tres agréables, les chambres sont tres biens, mobilier récent. Bon accueil, gentillesse des proprios, endroit calme et paisible, bien situé au coeur des Vosges. Les chambres sont bien entretenues, etc... Calme et confort sont au programme! das Ambiente, das Essen und Trinken, Ihre Herzlichkeit. Die ausgesprochen ruhige Lage steigert den Erholungswert. Für viel Abwechslung sorgt der kleine Border Collie Lardo und unsere Radtouren u.a. auf den Grand Ballon waren ein Traum. Danke für 4 herrliche Tage von Volker u. Manfred. Situated near the forest, near the Grand Ballon, walks are possible from the inn; the ridge road is nearby and you are surrounded by nature. Le petit déjeuner à 8,50 € n'est pas inclus dans le tarif.